There is a wine revolution going on all over the world right now. More and more young people are moving to the country side to rehabilitate old wineries and vineyards. Wine popularity has been on the rise the past few years and according to a new report by the Wine Market Council and as reported by the Wine Spectator, millennials accounted for 42% of all wine drunken in North America in 2015. We here at Antidote took the liberty to try these French wines for your information and enjoyment. Enjoy responsibly and your welcome for the hookup. This producer is characterized by slow and sustainable viticulture, which becomes quite apparent as there is much elegance and length in the mouthfeel of this Champagne. This NV is aged significantly longer than the appellation requirement, spending 3 years sur lie, with very low dosage to keep it fresh and crisp. On the nose, citrus notes open with lime and grapefruit flesh, followed by red currant, morello cherries, and warm bread. On the palate, toasted almond is amplified with yet some further yeasty notes, as well as fresh figs. Medium bodied, with a lengthy, but delicate finish, this is yet another stunning number from the well- respected Bruno Paillard. Picpoul is known for its remarkable freshness and racy acidity, and this vintage features both along with some delightful notes of honey, cracked pepper, orange blossom and lemon zest. On the palate this wine follows through with some notable florality, with a crisp and almost briny texture. This remarkable freshness will pair quite nicely with fresh oysters, Sarde in Saor, Baccala or salted cod on toast. Light to medium bodied, this wine is youthful and ready to drink now. Cotes De Nuits, Bachelder Bourgone, “Les Longues,” Burgundy, 2010. 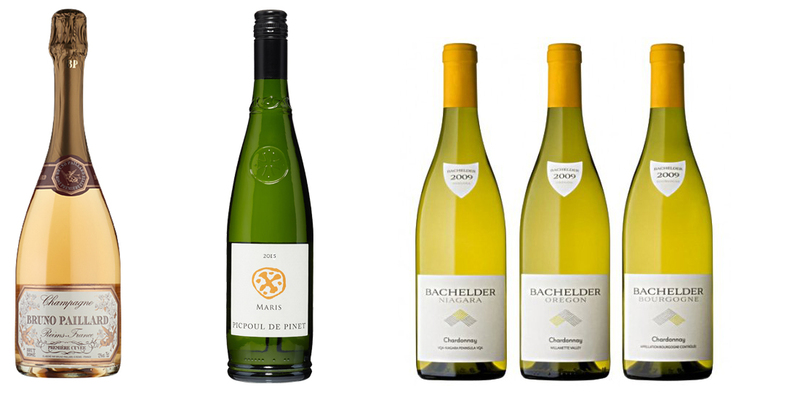 Recently cited as one of the greatest wine makers in the world by Fine Wine Magazine with his more recent releases from Oregon, Thomas Bachelder is creating a whirlwind of acclaim from even the most discerning critics. This gorgeous Chardonnay is certainly no exception to his roster. Barrel fermented for 18 months in new and old French barrels, with some lees contact, wild yeasts and only partial Malo, the depth and complexity of this wine is quite evident right off the jump. On the nose, nutty, toasty notes with warm pear and fresh apple notes are followed by some peach and even honeydew. The palate is dense, and albeit, still bright in the mid-palate. It has ample acid, refined structure with creamy fruit and a firm mineral finish. Quite marvelous on its own, and also rather enjoyable with lobster, scallops and rich pasta sauces.